You don’t need to own expensive equipment or possess an advanced degree in astronomy to appreciate all the night sky has to offer. You only need access to an open observing area, preferably away from the light pollution of cities and suburbs, be armed with the tools listed below and have an interest in getting lost in the magnificence of our universe. Let this week’s first quarter moon light your way safely to observing the wonders of the night. As we discussed last week, we’ve got a fair number of planets in our night sky going into the month of May. Mars, in the constellation Taurus, and Jupiter, in Virgo, are still visible shortly after sunset while Saturn, west of Sagittarius, and Venus, in Pisces, still grace our early morning skies. When we look to the night sky, even in urban environments, it can be easy to get lost among the tiny points of light. It is for this reason constellations exist. For thousands of years, countless cultures have created patterns in the sky to do everything from marking the passage of time to determining when to plant and harvest crops. They used the patterns in the sky to tell stories of their people and civilization. Back then and to this day these shapes help us to orient ourselves on the planet and aid us in navigating our world. Over the centuries constellations have come and gone from our records due to the natural drift of stars in the galaxy. Today, 88 constellations are officially recognized by the International Astronomical Union. However, constellations are not the only patterns we see above. When you look at the night sky in the northern hemisphere one pattern that stands out very prominently is the Big Dipper. This ladle in the sky is easily distinguished from other stars and is used to help find Polaris, the north star. The Big Dipper is not a constellation but is, in fact, an asterism within the constellation Ursa Major, the big bear. A constellation is a collection of stars making up a pattern. Asterisms are a pattern of stars within a constellation or spread across multiple constellations. Another prominent asterism that will start making its way higher into the night sky as we move further into the year is the Summer Triangle. The Summer Triangle is composed of three stars in three separate constellations. It is made up of Vega in the constellation Lyra, the Lyre, Deneb the head of Cygnus the swan and the star Altair in the constellation Aquila, the eagle. One other prominent asterism in the night sky is known as the Keystone. It is composed of the four stars that make up the body of Hercules, the hero of Greek myth. 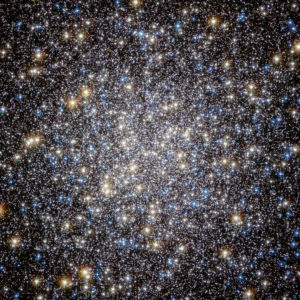 Hercules is also home to this week’s famous cluster, M13, also known as the Great Globular Cluster. Discovered by Sir Edmond Halley in 1714, it was catalogued by Charles Messier in 1764, the M in M13 being for Messier. It is composed of approximately 300,000 stars. While it is visible to the naked eye, it is better observed with the aid of equipment. Look to the East an hour or two after sunset. Hercules will appear to be lying on its side as it rises into the night sky. Find the two upper stars that compose the keystone and on a straight line between the two look one third of the way from the left most star and you will find your cluster. Once you’ve found it naked eye try observing it through a pair of binoculars. Speaking of Sir Halley, we are in store for an astronomical treat this coming Saturday. At this time the earth is passing through the orbital path of the famed Halley’s comet. This happens twice a year as we make our rotation around the sun. In mid-autumn we pass through the dust of the comet giving way to the Orionid meteor shower. In mid spring we pass through the same dust trail giving us the Eta Aquariid meteor shower. The name of the shower is determined by the constellation the meteors appear to be emanating from. This month the peak of meteors will be the early morning of May 6. To orient yourself look for Venus in the morning sky to the east. Just up and to the right of Venus is the constellation Aquarius. The majority of meteors will appear to emanate from that direction. So find yourself a nice dark area prior to sunrise to observe this phenomenon. As you are out and about under the night sky, look up and see if you can make out the constellations we mentioned or others you might be familiar with. If you are in exceptionally dark skies it might be hard to pick out the key stars among the millions visible. For those of you in urban or suburban skies constellation stars may be the only ones you can pick out due to light pollution. To find an optimum observing location near you visit the map resource on our website to enter your location and Find a Dark Sky Place. Be sure to check in next week when we will learn more about famed astronomer Charles Messier, what the Bortle Scale is and what it means for you and the difference between apogee and perigee.